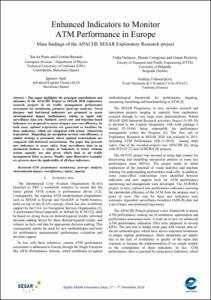 This paper highlights the principal contributions and outcomes of the APACHE Project (a SESAR 2020 exploratory research project) in air traffic management performance assessment for monitoring purposes (post-ops analysis). Novel distance- and fuel-based indicators are proposed to assess environmental impact inefficiencies, taking as input only surveillance data sets. Similarly, novel cost- and trip-time-based indicators are proposed to assess airspace user cost-efficiency. In both cases, optimal trajectories are generated as baselines for these indicators, which are compared with actual (historical) trajectories. Regarding air navigation services cost-efficiency, a similar strategy is presented, where optimal sectorisations are compared with historical sectorisations. The paper also presents new indicators to assess safety from surveillance data in an automated fashion. A couple of indicators to better estimate system capacity are also given, which look at air traffic management delay as proxy. Finally, some illustrative examples are given to show the applicability of all these indicators. Prats, X. [et al.]. Enhanced Indicators to Monitor ATM Performance in Europe. Main findings of the APACHE SESAR Exploratory Research project.. A: SESAR Innovation Days. "Proceedings of the 8th SESAR Innovation Days". 2018.